Clement Clarke Moore (July 15, 1779 – July 10, 1863) was a writer and American Professor of Oriental and Greek Literature, as well as Divinity and Biblical Learning, at the General Theological Seminary of the Protestant Episcopal Church, in New York City. The seminary was developed on land donated by Moore and it continues on this site at Ninth Avenue between 20th and 21st streets, in an area known as Chelsea Square. Moore's connection with the seminary continued for more than 25 years. Moore gained considerable wealth by subdividing and developing other parts of his large inherited estate in what became known as the residential neighborhood of Chelsea. Before this, the urbanized part of the city ended at Houston Street on Manhattan island. For 10 years, Moore also served as a board member of the New York Institution for the Blind. He is credited and is most widely known as the author of the Christmas poem "A Visit from St. Nicholas", first published anonymously in 1823. It later became widely known as "'Twas the Night Before Christmas" and has been published in numerous illustrated versions in various languages. Scholars debate the identity of the author, calling on textual and handwriting analysis as well as other historical sources. Moore was born on July 15, 1779 in New York City at Chelsea, at his mother's family estate, although his parents established their own residence in Elmhurst, Queens. He was the son of Bishop Benjamin Moore (1748–1816) and Charity (née Clarke) Moore (1747–1838). His father headed the Episcopal Diocese of New York, which then covered the state. It was organized after the American Revolutionary War when the church became independent of the Church of England. During the uncertain years of the war, when Loyalists associated with what was known as King's College left for Canada, Moore became president of the renamed Columbia College (now Columbia University). He served twice in this position. Moore's paternal grandfather was Major Thomas Clarke, an English officer who stayed in the colony after fighting in the French and Indian War. He owned the large Manhattan estate "Chelsea," then in the country north of the developed areas of the city. As a girl, Moore's mother Charity Clarke wrote letters to her English cousins. Preserved at Columbia University, these show her disdain for the policies of the British monarchy and her growing sense of patriotism in pre-Revolutionary days. Moore's grandmother Sarah Fish was a descendant of Elizabeth Fones and Joris Woolsey, one of the earlier settlers of Manhattan. After his grandfather Clarke's and mother's deaths, Moore inherited the Chelsea estate. He earned great wealth by subdividing and developing it in the 19th century. Moore graduated from Columbia College (1798), where he earned both his B.A. and his M.A..
One of Moore's earliest known works was an anonymous pro-Federalist pamphlet published prior to the 1804 presidential election, attacking the religious views of Thomas Jefferson (the incumbent president and Democratic-Republican candidate). His polemic, titled in full "Observations upon Certain Passages in Mr. Jefferson's Notes on Virginia, which Appear to Have a Tendency to Subvert Religion, and Establish a False Philosophy", focused on Jefferson's Notes on the State of Virginia (1785). Moore concluded this work was an "instrument of infidelity". In 1820, Moore helped Trinity Church organize a new parish church, St. Luke in the Fields, on Hudson Street. He later gave 66 tracts of land – the apple orchard from his inherited Chelsea estate– to the Episcopal Diocese of New York to be the site of the General Theological Seminary. Based likely on this donation, and on the publication of his Hebrew and English Lexicon in 1809, Moore was appointed as professor of Biblical learning at the Seminary. He held this post until 1850. Moore owned several slaves during his lifetime, as was customary of many in his class. He opposed the abolition of slavery. New York State passed a gradual abolition law in 1799 after the Revolution; it freed the last slaves in the state in 1827. 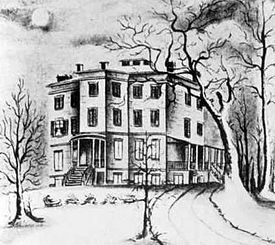 After the seminary was built, Moore began the residential development of his Chelsea estate in the 1820s with the help of James N. Wells, dividing it into lots along Ninth Avenue and selling them to well-heeled New Yorkers. Covenants in the deeds of sale created a planned neighborhood, specifying what could be built on the land as well as architectural details of the buildings. Stables, manufacturing and commercial uses were forbidden in the development. From 1840 to 1850, Moore also served as a board member of the New York Institution for the Blind at 34th Street and Ninth Avenue (now the New York Institute for Special Education). He published a collection of poems (1844). This poem, "arguably the best-known verses ever written by an American", was first published anonymously in the Troy (NY) Sentinel on December 23, 1823. It was sent to the paper by a friend of Moore. It was reprinted frequently thereafter and published as a small book in illustrated versions. It was not until 1837, in The New-York Book of Poetry (edited by Charles Fenno Hoffman), that the poem was first attributed in print to Moore. Moore claimed authorship by including it in his Poems, an 1844 anthology of his works. His children, for whom he had originally written the piece, encouraged this publication. At first Moore had not wished to be connected with the popular verse, given his public reputation as a professor of ancient languages. By then, the original publisher and at least seven others had already acknowledged him as author. Moore was said to have written the poem while visiting his cousin, Mary McVicker, at Constable Hall, in what is now known as Constableville, New York. In 1855, Mary C. Moore Ogden, one of the Moores' married daughters, painted "illuminations" to go with the first color edition of her father's celebrated verse about Christmas. Scholars have debated whether Moore was the author of this poem. Professor Donald Foster used textual content analysis and external evidence to argue that Moore could not have been the author. Foster believes that Major Henry Livingston, Jr., a New Yorker with Dutch and Scottish roots, should be considered the chief candidate for authorship. This view was long espoused by the Livingston family. Livingston was distantly related to Moore's wife. Foster's claim, however, has been countered by document dealer and historian Seth Kaller, who once owned one of Moore's original manuscripts of the poem. Kaller has offered a point-by-point rebuttal of both Foster's linguistic analysis and external findings, buttressed by the work of autograph expert James Lowe and Dr. Joe Nickell, author of Pen, Ink and Evidence. There is no proof that Livingston himself ever claimed authorship, nor has any record ever been found of any printing of the poem with Livingston's name attached to it. But, according to the original copy of the poem that was sent to The Sentinel, the names of Santa's last two reindeer were Dunder and Blixem, instead of Donder (later Donner) and Blitzen, as printed. The changes in spelling are attributed to a printing error and/or correcting Moore's spelling inaccuracies, as he did not speak Dutch. In 2016, the matter was further discussed by MacDonald P. Jackson, an emeritus professor of English at the University of Auckland, a fellow of the Royal Society of New Zealand and an expert in authorship attribution using statistical techniques. He evaluated every argument using modern computational stylistics, including one never used before - statistical analysis of phonemes - and found, in his opinion, that in every test that Livingston was the more likely author. Margaret Elliot Moore (1815–1845), who married John Doughty Ogden (1804–1887), a grandson of U.S. Attorney Abraham Ogden and nephew of U.S. Representative David A. Ogden. Charity Elizabeth Moore (1816–1830), who died young. Benjamin Moore (1818–1886), who married Mary Elizabeth Sing (1820–1895), in 1842, and were the parents of Clement Clarke Moore. Mary Clarke Moore (1819–1893), who married John Doughty Ogden, her older sisters widower, in 1848. Clement Moore (1821–1889), who did not marry. Emily Moore (1822–1828), who also died young. Catharine Van Cortlandt Moore (1825–1890), who did not marry. Maria Theresa Barrington Moore (1826–1900), who did not marry. Moore died on July 10, 1863, at his summer residence on Catherine Street in Newport, Rhode Island, five days before his 84th birthday. His funeral was held in Trinity Church, Newport, where he had owned a pew. His body was returned to New York for burial in the cemetery at St. Luke in the Fields. On November 29, 1899, his body was reinterred in Trinity Church Cemetery in New York. Moore's estate, named Chelsea, was on the west side of the island of Manhattan above Houston Street, where the developed city ended at the time. It was mostly open countryside before the 1820s. It had been owned by his maternal grandfather Maj. Thomas Clarke, a retired British veteran of the French and Indian War (the North American front of the Seven Years' War). Clarke named his house for the Royal Hospital Chelsea in London that served war veterans. The estate was later inherited by his daughter and Moore's mother, Charity Clarke Moore, and ultimately by grandson Clement Moore and his family. When the government of New York City laid down the street grid in Manhattan, based on the Commissioner's Plan of 1811, the new Ninth Avenue was projected to go through the middle of the Chelsea estate. Moore wrote and published a pamphlet calling on other "Proprietors of Real Estate" to fight the continued development of the city, which then ended at Houston Street. He thought it was a conspiracy designed to increase political patronage and appease the city's working class. He also decried having to pay taxes for public works such as creating new streets, which he called "a tyranny no monarch in Europe would dare to exercise." Despite his protests, Moore eventually began to develop Chelsea, generating high revenues for himself by dividing it into lots along Ninth Avenue and selling them to well-heeled New Yorkers. He donated a large block of land to the Episcopal diocese for construction of a seminary, giving them an apple orchard consisting of 66 tracts. Construction began in 1827 for the General Theological Seminary. 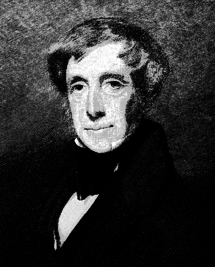 Based on his knowledge of Hebrew, Moore was appointed as its first professor of Oriental Languages, serving until 1850. The Seminary continues to operate on the same site, taking up most of the block between 20th and 21st streets and Ninth and Tenth avenues. Ten years later, Moore also gave land at 20th Street and Ninth, east of the avenue, to the diocese for construction of St. Peter's Episcopal Church. The contemporary Manhattan neighborhood is known as Chelsea after his estate. In 1911, the Church of the Intercession in Manhattan started a service on the Sunday before Christmas that included a reading of the poem followed by a procession to Moore's tomb at Trinity Church Cemetery on the Sunday before Christmas. This continues until this day. Clement Clarke Moore Park, located at 10th Avenue and 22nd Street in Chelsea, is named after Moore. A playground opened in the park November 22, 1968, and was named for Moore by local law the following year. In 1995 it was fully renovated, and new trees were added. Local residents gather annually there on the last Sunday of Advent for a reading of "Twas the Night Before Christmas." PS13 in Elmhurst, Queens is named after Clement C. Moore. ^ a b Genealogical Record of the Saint Nicholas Society: Advanced Sheets, First Series. Saint Nicholas Society of the City of New York. 1902. p. 42. Retrieved 18 January 2019. ^ Collins, Paul (2006). "Jefferson's Lump of Coal", The New York Times, 24 December 2006. Retrieved 30 April 2013. ^ Dickinson W. Adams (ed. ), Jefferson's Extracts from the Gospels: "The Philosophy of Jesus" and "The Life and Morals of Jesus" (Princeton University Press, 1983), p. 12, citing Clement C. Moore, Observations upon Certain Passages in Mr. Jefferson's Notes on Virginia, which Appear to Have a Tendency to Subvert Religion, and Establish a False Philosophy (New York, 1804), p. 29. ^ Siefker, Phyllis (1997). Santa Claus,. McFarland & Company. p. 4. ISBN 0-7864-0246-6. ^ Kaller, Seth. "The Authorship of The Night Before Christmas". ^ Lowe, James. "A Christmas to Remember: A Visit from St. Nicholas." Autograph Collector. January 2000. 26-29. ^ Nickell, Joe. "The Case of the Christmas Poem." Manuscripts, Fall 2002, 54;4:293-308; Nickell, Joe. "The Case of the Christmas Poem: Part 2." Manuscripts, Winter 2003, 55;1:5-15. ^ snopes (23 December 2015). "Donner or Dunder : snopes.com". snopes. ^ Jackson, MacDonald P. (2016). Who Wrote "The Night Before Christmas"? : Analyzing the Clement Clarke Moore vs. Henry Livingston Question. McFarland. ISBN 978-1476664439. ^ a b Constant, Silas; Roebling, Emily Warren (1903). The Journal of the Reverend Silas Constant, Pastor of the Presbyterian Church at Yorktown, New York: With Some of the Records of the Church and a List of His Marriages, 1784-1825, Together with Notes on the Nelson, Van Cortlandt, Warren, and Some Other Families Mentioned in the Journal. Private Circulation. p. 431. Retrieved 18 January 2019. ^ a b "Clement Clarke Moore and Santa in the City". www.mcny.org. Museum of the City of New York. Retrieved 18 January 2019. ^ a b Alstyne, Lawrence Van; Ogden, Charles Burr (1907). The Ogden family in America, Elizabethtown branch, and their English ancestry: John Ogden, the Pilgrim, and his descendants, 1640-1906. Printed for private circulation by J.B. Lippincott company. p. 190. Retrieved 18 January 2019. ^ "Some Happenings in Good Society". The New York Times. 21 Jan 1900. p. 17. Retrieved 20 January 2019. ^ Statement of Revenues and Disbursements | Account of the City of New York and Balance Sheet for December 31, 1901. 1902. p. 25. Retrieved 18 January 2019. ^ "Clement Clarke Moore | American scholar and author". britannica.com. Encyclopedia Britannica. Retrieved 18 January 2019. ^ Janvier, Thomas Allibone (1894). In Old New York. Harper & Brothers. pp. 167–9. ^ "DR. MOORE'S GRAVE VISITED BY CHILDREN - Wreath Is Placed in Memory of Yuletide Poem's Author at Annual Ceremony. TABLET ALSO HONORS HIM It Is Unveiled at Chelsea Spot Where Verse Was Written--Dickens's Son Remembered. - Article - NYTimes.com". 25 December 1930. ^ "CHURCH SERVICES TOMORROW". 22 December 1917. ^ "Clement Clarke Moore Park". Foster, Donald (2000). Author Unknown: On the Trail of Anonymous. New York: Henry Holt. ISBN 0-8050-6357-9. James W. Moore (1903), Rev. John Moore of Newtown, Long Island and some of his Descendants. Easton, PA:Chemical Publishing Company, p. 107. Nissenbaum, Stephen (1997). The Battle for Christmas: A Social and Cultural History of Christmas that Shows How It Was Transformed from an Unruly Carnival Season into the Quintessential American Family Holiday. New York: Alfred A. Knopf. ISBN 0-679-41223-9. Observations upon Certain Passages in Mr. [Thomas] Jefferson's Notes on Virginia which Appear to have a Tendency to Subvert Religion, and Establish A False Philosophy (New York, 1804). Biography of Moore at University of Toronto's Representative Poetry Online. Clement Clarke Moore's "A Visit from St. Nicholas"